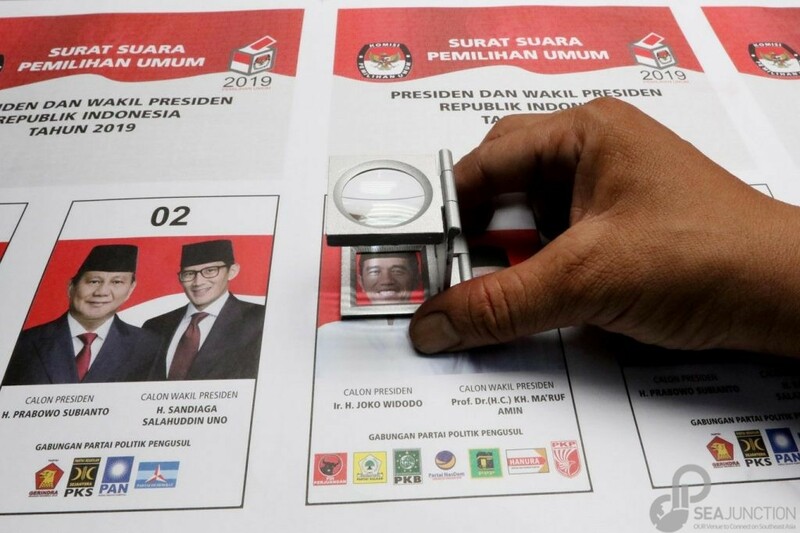 Overseas voters were the first to cast their ballots, between April 7 and 14, in Indonesia’s first-ever simultaneous presidential and legislative elections, which are set for April 17. After Sana’a and Tarimin in Yemen and Quito in Ecuador, on April 10 it was the turn of Thailand. Two polling stations were set up at the Indonesian Embassy in Bangkok and one at the Indonesian Consulate in Songkla, southern Thailand. While entering the embassy as an election observer, I could not help but ponder the significance of such a large-scale election with over 190 million registered voters, with about 2 million of them living abroad. Amid the regional and global climate of democratic rollback and increasing authoritarianism, Indonesia is one of the few Southeast Asian countries that have managed to stick to a truly democratic election process for the last two decades. There may be shortcomings here and there, but the freedom of expression demonstrated during the campaign period has been far greater than that in most neighboring countries, including Thailand. And if the enthusiasm of the election team as well of that of the voters here is any indication, maybe democracy might not to be written off completely after all. In the leisurely ambience of Bangkok, the acrimony of the ongoing campaign seemed far away as there were no angry faces, no screams, and no agitated gestures. The Overseas Elections Committee (PPLN) team worked like a well-oiled machine, catering to the needs of the public as well as promptly dealing with bureaucratic errors and unforeseen circumstances. They, as well as the candidates’ witnesses, security forces and embassy personnel, showed true professionalism and courtesy, and the voters responded with patience and grace. In between smiles and selfies, people of diverse backgrounds, faiths and political affiliations blended and chatted while waiting on their turn to vote. If there was a complaint, it was about the extreme heat, which soared to more than 37 degrees Celcius at around noon. By then the morning rush was over and about half of the expected 1,000 voters had cast their ballots. At the consulate in southern Thailand, another 62 people had voted. The election team was eager to see the numbers grow as they had worked hard to encourage everyone to vote. For months, they had promoted the election and encouraged registration, at times luring participants to dry meetings about the regulations with Indonesian delicacies. The number of registered voters has doubled compared to 2014, a sign of their hard work as well as the growing Indonesian population in Thailand. In particular, the country has become a student destination. Based on last year’s unpublished data from the Indonesian Embassy, the number of Indonesians living in Thailand (excluding descendants) was around 3,200, comprising about 50 percent students, 30 percent employees, and 20 percent “others” such as retirees and their dependents. And indeed, there were many young faces, with many first-time voters still being in uniform. When asked what motivated them to vote, a group of science and technology undergraduate students from the universities of Chulalongkorn and Rajamangala answered that they thought their country and its diversity was at a critical juncture and felt that their vote would make a difference. Female PPLN members were also visibly present and women filled all witness spots. The majority of voters were also female — a clear sign that feminism is alive and well in Indonesia, contrary to recent claims! Sitting composed in a soaked shirt under a tent at the entrance of the polling stations, Ambassador Ahmad Rusdi monitored the situation to ensure everything was proceeding in an orderly fashion. He explained that his objective was to serve the voters in the best possible way as well as to ensure a peaceful and respectful climate. He pointed to the cleaners and the spotless premises while stressing that “cleanliness and the spirit of service have to be felt from the moment people step foot into the embassy”. From the initial counting, which is yet to be confirmed, 1,019 voters cast their ballots. Most had registered before December 2018, 219 were additional voters registered before February and 96 were special voters who could only obtain a ballot if they showed proof of citizenship and residency in Thailand. Of the over 500 people who were expected to vote by mail, more than half had mailed their ballots or had gone to the embassy to bring it in person. Most touching was the 18 imprisoned Indonesians who had cast their vote thanks to the mobile “drop-box” method provided by election officers. Some of them are in prison for drug- and theft-related offenses. At the end of the day, the two boxes with the precious ballots were sealed, signed by both witnesses and locked with three padlocks. The two boxes are now safely stored in a sterile room. The ballots will be counted on April 17 at a time yet to be decided, probably when polling stations in Jakarta close. After supervising the entire process, Ahmad promised to make the vote counting a special occasion, irrespective of the winner, saying “it is a celebration of the will of the people”. *Author: The writer is registered as an international election observer for the 2019 general election. She is an associate professor at the Institute for Population and Social Research, Mahidol University, director of SEA Junction, Bangkok, and emeritus regional director for Southeast Asia with the Rockefeller Foundation and the International Development Research Center. ** Disclaimer: The opinions expressed in this article are those of the author and do not reflect the official stance of The Jakarta Post or the organizations she is associated with.